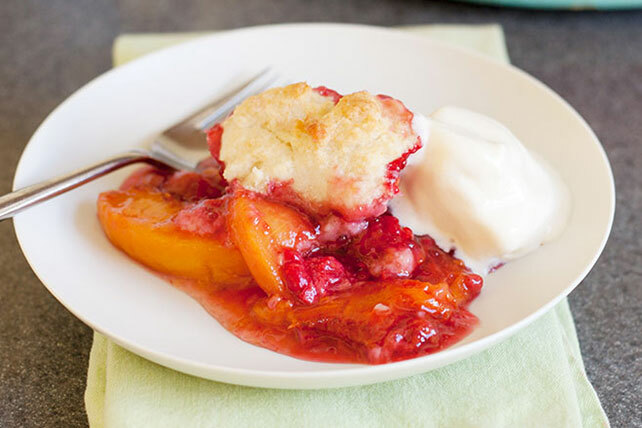 Top this Peach Raspberry Cobbler recipe with spoonfuls of an easy biscuit dough. Bake it all up for a warm, comforting Peach Raspberry Cobbler. Combine peaches, 3/4 cup sugar and tapioca in large saucepan. Stir in water. Bring to boil on medium heat, stirring occasionally. Stir in raspberries. Pour into 9-inch square baking dish; dot with 1 Tbsp. butter. Mix flour, 2 Tbsp. sugar, baking powder and salt in medium bowl. Cut in remaining butter until mixture resembles coarse crumbs. Stir in milk until mixture forms soft dough. Drop by heaping tablespoonfuls onto hot fruit mixture. Bake 30 min. or until biscuit topping is golden brown. Substitute 1 pkg. (20 oz.) frozen sliced peaches, thawed, for the sliced fresh peaches. Practice mindful eating by savoring the flavor of this warm dessert and sticking to the recommended serving size. Top each serving with 2 Tbsp. thawed COOL WHIP Whipped Topping or a small scoop of vanilla ice cream.